A Signature to Eiffel Bakery are butter croissants created in small batches several times a day to maintain crispiness as well as a fresh texture and flavour. They are made only with the finest of butter from France like all our bread and pastry products for exceptional quality and taste. For our customers who fancy something with a little bit more French pastry zing, our Lemon Tart made with high quality flour from Les Grand Moulins de Paris is worth a try. We make fresh lemon cream using organic lemons sourced from the Royal Projects of Thailand. For our Chocolate Éclair, Chef Thierry uses rich Valrhona chocolate and originally sourced Dominican cocoa from our Valrhona Grand Cru chocolate selections to give them a rich distinct flavour. Artfully created with pure vanilla bourbon from Tahiti and Madagascar translating into a feathery smooth filling. 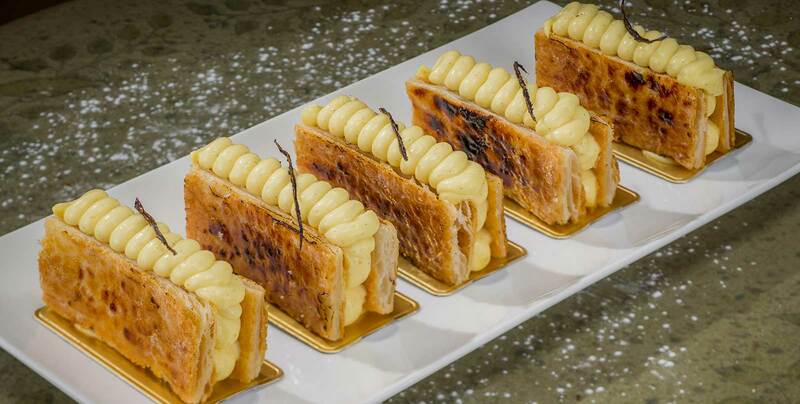 With every airy bite of this delectable caramelised puff pastry, our customers experience the astute attention given to the preparation and baking process of our Mille-feuille. Based in Bangkok, we at Eiffel Bakery take our passion beyond recipes by hand-picking superior ingredients from our home in Europe. Patisserie is our forte and we strive to preserve the very definition of classic French patisserie down to the very minute details of pastry making. What our customers are left with are our carefully handcrafted works of passion that blend the delicate flavours of classic key ingredients with the virtuoso of our world-class chef. From premium Valrhona chocolates to our excellent Les Moulins de Paris flour and exquisite AOC-certified butter from Normandy, Eiffel Bakery is your classic French Patisserie to stop by and satisfy your sweet tooth.